This weekend I had an afternoon to myself. 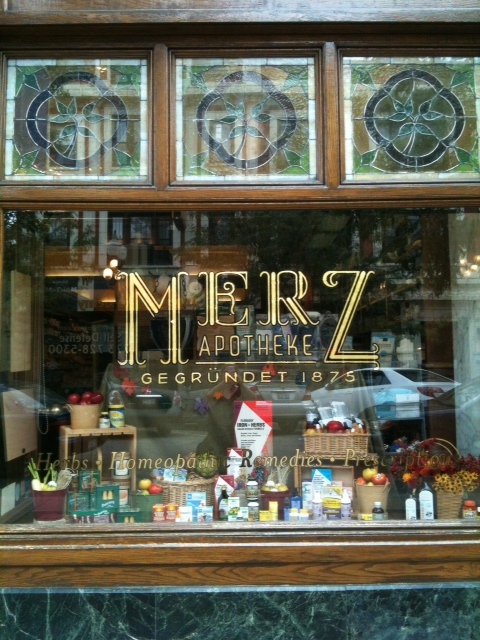 Wanting to take full advantage of this rarity I took myself out to brunch and wandered up the street to the Merz Apothecary. Merz was one of my first discoveries when I moved to Chicago 12 years ago. It’s original outpost is in the Lincoln Square neighborhood – a leftover from when Lincoln Square was mostly German. Merz is filled head to toe with German and European brands and many of the labels are in German. Luckily the staff is very helpful with interpreting labels and giving advice. I get lost in the aisles every time I go . They must have 100 different brands of soap if not more and every cream and lotion you can think of. 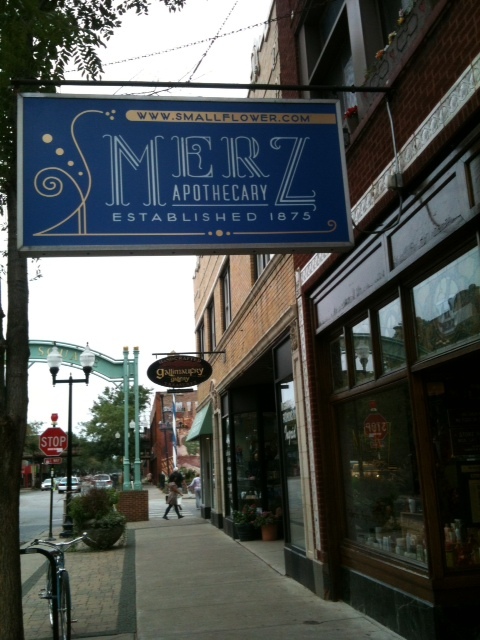 Merz is focused on natural and holistic skin and body care. It’s a very a quaint and quirky shop. I’ve never seen anything like it, not even in Germany. Photo taken on the “down-low”. After an hour of browsing (so decadent!) here was my haul of goodies. I’ve used both Labello’s lip balms and Herbacin’s hand moisturizers before. Both brands are of good quality and reasonably priced. I’m a little on the fence about the clay mask as it smells like incense but it was recommended so I will give it a try. The flowers are compliments of my garden. They are pretty too. Hey, this looks familiar – did you take me here? Probably – maybe? Did were we shopping for handbags too? I usually take my out town guests up to Lincoln Square. It’s a fun neighborhood. We did indeed! It was a fun (if wet) day! I flew back from visiting my inlaws in Ireland. (Before anyone gets jealous, we had a 3 y.o. and a baby with us!) My question is: where did you go for brunch? I went to Fork and had the eggs Benedict. So good! « Let’s all get rid of our (eye) baggage!